Kiwi Design were thrilled to attend the Grand Opening of the new BOFA Head Office in Creekmoor, Poole, after a recent refurbished by our team. 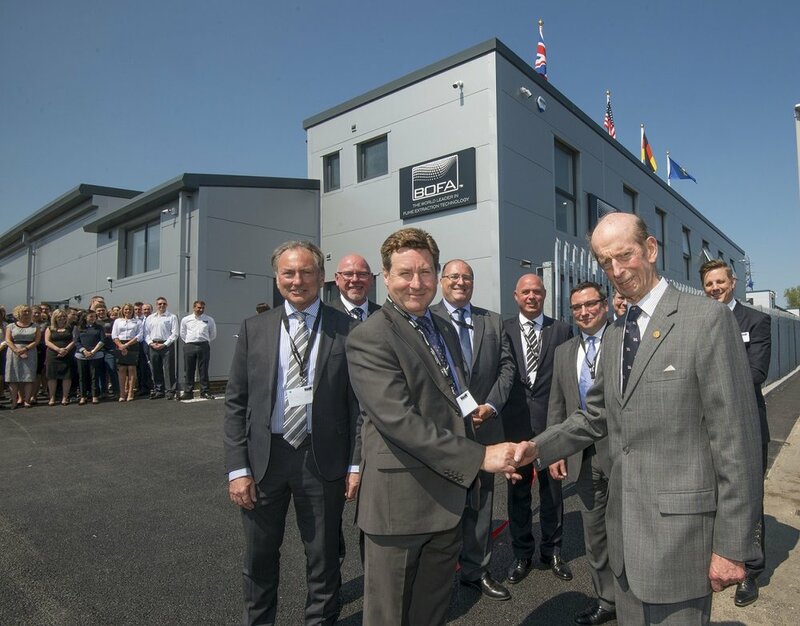 The renovated building was opened by HRH The Duke of Kent on May 15th 2018, in front of staff and selected guests. His Royal Highness and other guests were then escorted on a tour of the completed building, before being introduced to the team who made the refurbishment possible; including Kiwi Design Senior Project Manager, Andrew Barnetson. “We are very proud to fly the flag for British Manufacturing and our investment in these new facilities will enhance our ability to innovate and expand as we drive forward our ambitious plans for the future”. BOFA are the world’s leading fume extraction technology company, having been in the business for over 30 years and recently received the Queen’s Award for Innovation. The equipment that they design and manufacture is used in 120 countries to remove fumes and dust across the laser, electronics, printing, dental, beauty and pharmaceutical industries. After BOFA acquired this 12,000 sq. ft. /1,100 sq. m. industrial unit, adjacent to current buildings, Kiwi Design were contracted to fully renovate the building to house the customer support, marketing, product management, HR, general management and finance teams. The new state-of-the-art head office now houses an engaging and functional reception, professional boardroom with its own kitchen area, an open plan main workspace and individual management offices with glass partitioning. There is also a suite of flexible meeting rooms with bi-folding partitioning, giving the option of 3 separate meeting rooms or one large conference room. For more details and photos from this £410,000 project, please see the BOFA case study. “Kiwi Design showed value throughout our project. They ensured we understood the journey we were on and gave regular updates. They also offered expert advice to ensure we were steered away from potential problems. We look forward to providing additional office interior fit-out/refurbishment services for BOFA again very soon. If you are looking to maximise the use of the workspace for your team, contact us today to discuss the potential of your offices, workshops or warehouses. Kiwi Design showed value throughout our project. They ensured we understood the journey we were on and gave regular updates. They also offered expert advice to ensure we were steered away from potential problems. Welcome to the new Kiwi Design website!